What is the Acer Spin 1? 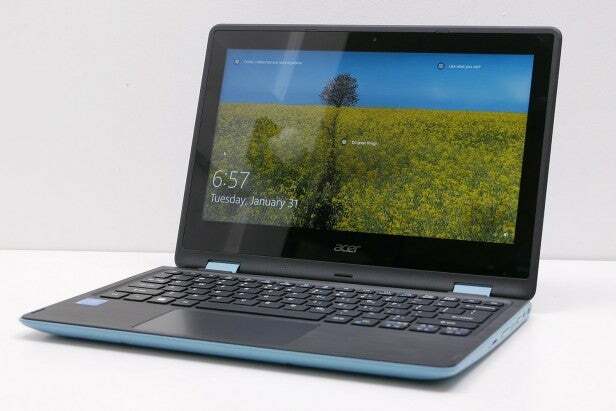 The Acer Spin 1 is a budget convertible laptop with folding screen that can be had for just £250. It’s the entry-level option in the company’s Spin range, coming in below the Spin 7, Spin 5 and Spin 3. Inevitably, such a low price comes with compromises. But there remains quite a lot to like here, just so long as you know what to expect. Editor’s note: The cheapest £250 version of this machine has a lower resolution screen and tiny 32GB eMMC drive. 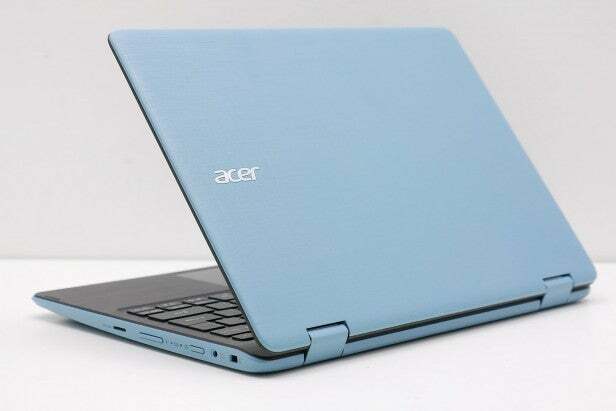 The model Acer supplied isn’t available in the UK at the time of publishing, but can be found online for approximately £340 in Germany. That makes it a reasonable option if you’re less fussed about performance and want the extra storage. Otherwise, the £350 model that’s available from Tesco in the UK is potentially the most appealing compromise. It has a slower processor but has a 64GB eMMC drive and the Full HD screen reviewed here. It’s no surprise that a laptop as cheap as the Spin 1 is all plastic, but Acer has used an attractive combination of colours and finishes to make a machine that looks rather fetching and feels reasonably solid. The pastel-blue outer shell sports a fabric-style pattern that provides good grip and should hide scratches well. Meanwhile, the inside has a faux brushed aluminium finish to the keyboard surround, which again manages to look pretty decent, despite its clear attempt to mimic more premium materials. The main letdown in terms of overall modern laptop design is the thick bezel surrounding the screen. It’s 22mm wide along the top, 20mm down the sides and 47mm along the bottom, making this laptop look decidedly dated next to the likes of the Spin 7. The bezels also contribute to this being a relatively large laptop considering it has an 11.6-inch screen, with dimensions of 297mm x 209mm. However, the upside to this is that you end up with more room for the keyboard and trackpad. What’s more, this is still a fairly slim and light machine, measuring 20.3mm thick and weighing in at 1.5kg. You can certainly get better, but not for this price. One advantage of it not being the most petite laptop we’ve ever seen is that it has plenty of room for ports. You get three full-size USB ports, although only one is USB 3.0; the others are regular USB 2.0. Alongside there’s full-size HDMI, too – useful for a quick and easy movie-watching – and a headphone jack. 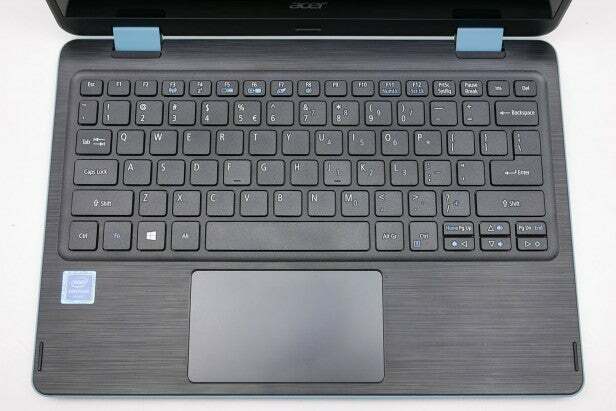 All those connections can be found on the left edge of the laptop, while the right is home to the power button, volume button, charging port, lock slot and a microSD slot. A full-size SD slot would arguably be more useful, but you can always use a microSD to SD adapter in your camera. Although the power button being on the side is now common for laptops that double as tablets, I’m not a fan – they’re inherently not visible most of the time and always seem frustratingly difficult to find by feel alone. What’s more, on occasion I did manage to accidentally hit the power button when picking up the laptop, which was quite annoying. This being a convertible laptop, the touchscreen rotates round to form a rudimentary tablet. As such, the hinge design is a key factor. 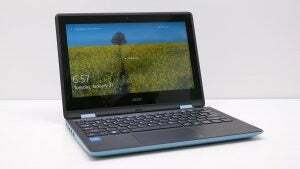 Thankfully, Acer hasn’t mucked it up as it did with the Spin 7. It remains in place no matter what angle you place it at, and it seems robust enough to withstand many a conversion. In addition, the laptop doesn’t tend to suffer the issue of tipping backwards like some convertibles. Less successful is the keyboard. For a start, the UK version still uses an American-style layout, meaning you miss out on a £ symbol and have the wrong-shaped Enter key. The key action isn’t that great, either. It requires a bit too much force, so you really have to hammer away to ensure a tap properly registers, reducing overall accuracy and typing speed. Also, there are no indicators for the various lock keys – Caps lock, Scroll lock and so on. An animation pops up on-screen when the lock key is pressed, but there’s no continued indication. I also found the cursor key arrangement to be a little cramped and would regularly hit the Home/End/PgUp/PgDown buttons accidentally instead. Likewise, the trackpad is adequate but not exactly the sort of thing you’ll want to be using for hours every day. Tracking is reasonably quick and accurate, but the click action again requires quite a bit of force and it isn’t that easy to perform more complicated manoeuvres such as dragging and dropping. The real standout feature of this laptop is its screen. Conscious of the fact that tablets are far more likely to be viewed from odd angles, Acer hasn’t skimped and gone for a cheap TN LCD but opted for IPS instead. This means the display largely looks good from any angle. It also packs in an impressive 1,920 x 1,080 resolution that results in a super-sharp image. Most of the time you’ll want to use Windows’ scaling settings to make everything look a little larger, but it’s great to have the option to run at full resolution for when you want to fit lots of information on-screen. What’s more, it performs reasonably well in most other regards too. Its maximum brightness isn’t all that high, at 260 nits, but it has a decent contrast ratio of 874:1 that ensures you don’t suffer one of the other classic problems with cheap displays, where everything can look a bit grey and washed out. The gamma setting is also perfect at 2.2. The colour temperature of 7,875K is some way off the ideal of 6,500K, but it doesn’t look too bad, with no obvious red or blue tinge to it. The one area it can’t really keep up with more expensive screens is in pure colour accuracy. It manages only 74.4% sRGB colour space coverage. As such, while this display can produce reasonably realistic and punchy-looking colours overall, it struggles to distinguish the fine nuances between different colours. In other words, it’s fine for casual use, with no really distracting problems, but isn’t the sort of thing you’ll want to use regularly for editing pictures or video. The post Acer Spin 1 appeared first on Trusted Reviews.